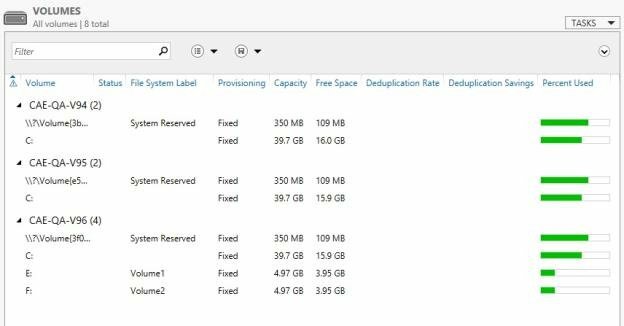 In Windows Server 2012, volume status can be viewed and volume manipulation can be performed within Server Manager > File and Storage Services > Volumes. 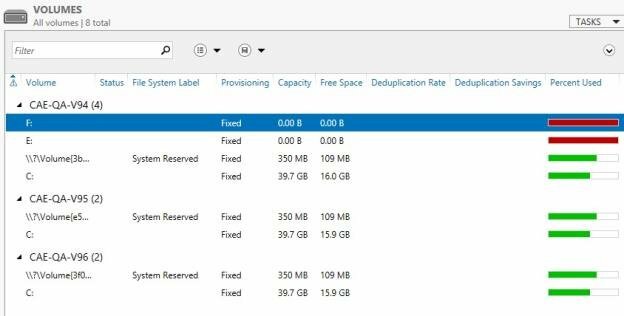 However, when using DataKeeper volumes with cluster resources, this interface will not accurately reflect volume status. In the following example, the DataKeeper Volumes E and F are split. One is Cluster Owner\Source on CAE-QA-V95 and the other is Cluster Owner\Source on CAE-QA-V96; however, the Server Manager “Volumes” display shows the volumes (E & F) on CAE-QA-V94 with red “percent used” progress bars and does not show any volumes on CAE-QA-V95 or CAE-QA-V96. If both resources share the same Cluster Owner\Source as in the following example (CAE-QA-V96), the Server Manager shows the correct information.